Straight out of Scranton, the employees of the Dunder Mifflin Paper Company are here to offer up an emotional primer on the musical accomplishments of Kanye West, the needy, frequently brilliant Michael Scott of the modern rapping world. Said guidance comes courtesy of a video—originally posted to YouTube earlier this month, by user MrBroks00—making the rounds on the internet tonight, in which Jim, Dwight, Pam, and the rest of the crew walk you through, if not the sound, then the feeling, of every album in West’s multi-platinum discography. These “albums described by” videos are pretty common on the web by now—case in point, Simpsons and Spongebob clips purporting to do the same thing—but they rarely feel quite so on-point in their summation of the public perceptions of West’s work. 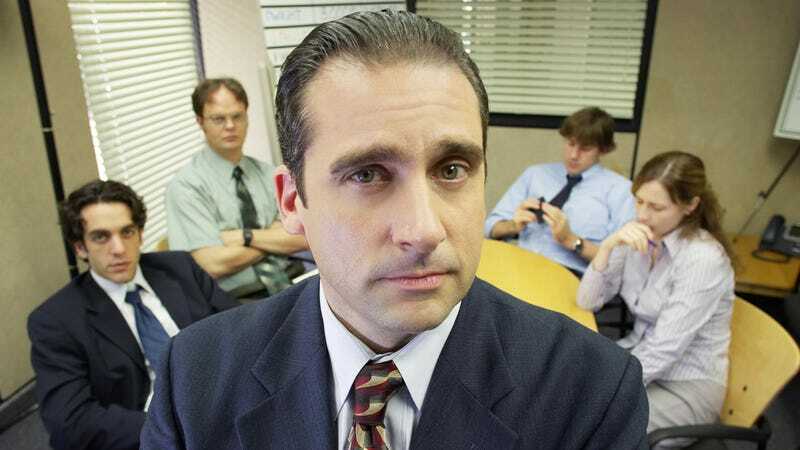 The obvious stand-out, of course, is the Darryl-based reaction to the rap-averse 808s And Heartbreak, but Steve Carell’s Michael describing My Beautiful Dark Twisted Fantasy in terms of his desperate need to (not) be liked is a pretty strong runner-up. Also, here’s a video of Rainn Wilson awkwardly rapping alongside the man himself from 11 years ago, because hey, why not?